Our tools for building a dependable future. Two Rivers Pipeline & Construction has been proudly serving the nation since 1978. Contact us today to become part of our growing legacy. Two Rivers Pipeline & Construction offers high quality services for large pipelining projects and various construction projects. Two Rivers has experience in many different enviroments, having served hundreds of clients all across the nation. At Two Rivers we strive to meet our customer's expectations in a timely manner and develop a strong professional relationship. Each customer is important to us, no matter where they are or what they ask of us. Each Two Rivers employee holds him/her self to our core values and mission, striving to deliver the best results we can offer. 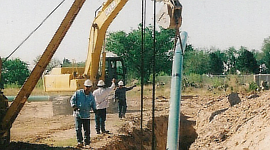 Two Rivers Pipeline & Construction specializes in a wide range of pipeline and construction services. To better understand our expertise, we invite you to explore some of our past projects.